Presbyopia is the gradual decline in close vision that occurs with age. The condition occurs as the lens in the eye stiffens and loses its flexibility, thereby impairing its ability to focus at images or objects up close. While multifocal prescription glasses, such as bifocals, are one possible treatment option for presbyopia, the popularity of vision correction surgery to treat presbyopia is increasing. Your ophthalmologist may use one of several surgical approaches to treat presbyopia. With all of the following presbyopia treatment options, the surgical goal is to create monovision. With monovision, the ophthalmologist corrects one eye so that it can see up close and the other eye so it can see in the distance. Over time, many patients are able to adapt to monovision, so they can ultimately see at multiple distances. When performing LASIK, or laser-assisted in-situ keratomileusis, the ophthalmologist creates a hinged flap in the surface of the cornea. After gently lifting back the flap, the eye surgeon removes tiny particles of corneal tissue to reshape the curvature of the cornea. In traditional LASIK surgery, this corrects the refractive error that is causing nearsightedness, farsightedness and / or astigmatism. When performing LASIK to treat presbyopia (by creating monovision), the ophthalmologist typically reshapes the curvature of cornea in the dominant eye so it can see in the distance. He or she intentionally leaves the non-dominant eye slightly nearsighted, so the patient can see up close with that eye. With photorefractive keratectomy (PRK), the ophthalmologist removes the front layer of the cornea (the epithelial layer) instead of creating a hinged flap in it. The remaining steps of PRK to treat presbyopia are the same as with LASIK. PRK is often a suitable treatment option for patients with corneas that are too thin to withstand corneal flap creation. Unlike LASIK and PRK, conductive keratoplasty (CK) involves the use of low-energy radiofrequency (RF) waves instead of laser energy to reshape the curvature of the cornea. During the CK procedure, the ophthalmologist uses an extremely thin probe that is finer than a human hair to apply RF energy around the outer section of the cornea. The connective tissue that was treated with RF energy shrinks, thereby creating a tightening effect around the circumference of the cornea. This causes the cornea to steepen, which helps restore near vision. 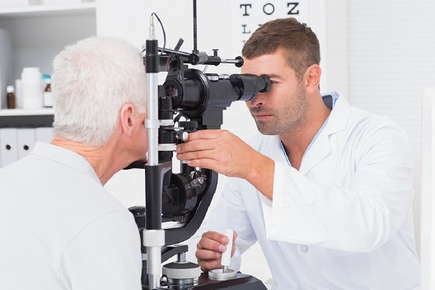 To treat presbyopia, the eye surgeon, again, only corrects one eye for near vision, leaving the other eye farsighted. Some patients may not be able to adapt to monovision. To find out whether you might benefit from undergoing LASIK, PRK, CK or another type of vision correction procedure that addresses presbyopia by providing monovision, please schedule an appointment with us. That way, you can try out monovision in our office to determine whether it is a suitable treatment option for you. If you are not an appropriate candidate for monovision, don’t worry. We will suggest alternative treatment options to help correct your presbyopia.